Loch Lomond and Helensburgh Photography: DANCING IN THE STREETS OF RAITH? DANCING IN THE STREETS OF RAITH? 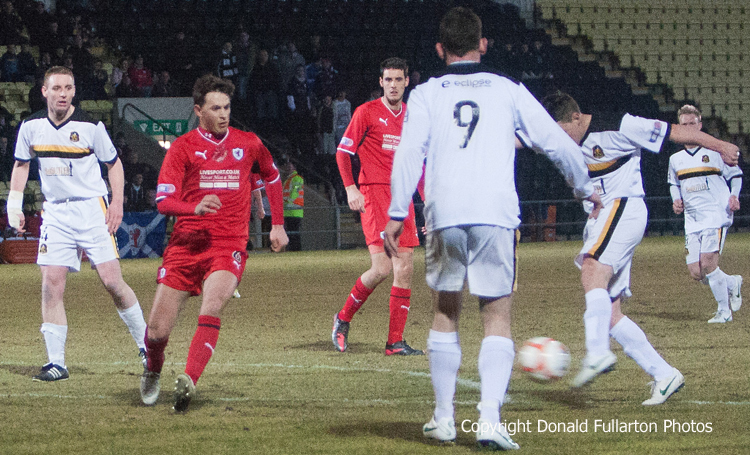 DUMBARTON'S battling performance went unrewarded when they lost this evening match at home to Raith Rovers 2-1. DUMBARTON'S battling performance went unrewarded when they lost this evening match at home at the Bet Butler Stadium to Raith Rovers 2-1. Both sides were desperate for the three points to keep them clear of the play-off slot in the first division, and there was no shortage of effort or excitement in a very close contest. The visitors opened the scoring through Greig Spence after a mix-up in the Sons defence, and this proved to be the only goal of the first half. Sons had several chances and might well have had a penalty when Bryan Prunty was pulled down in the box, but could not make their pressure count. After the break it was end to end, and in the 70th minute a superb volley by Mark Gilhaney on the edge of the box zoomed into the net for the equaliser (pictured). Both sides threw caution to the wind in search of a winner, and it came five minutes later for Raith when top striker Brian Graham netted from a fine cross after a breakaway. The home side tried hard for a second equaliser, but it was not to be. Their consolation was that another defeat for Airdrie United meant that they can no longer catch Sons, who therefore avoid automatic relegation.